Cygnus OA-5, named the SS Alan Poindexter after the late NASA Astronaut, launched back on October 17 atop the first Antares 200-series rocket, returning to flight from the Wallops Flight Facility after a two-year gap to fit the launcher with new engines following the dramatic launch failure on the Orb-3 mission back in 2014. The revamped Antares performed admirably and in fact boosted the Cygnus spacecraft into a higher orbit than expected in simulations of the new rocket’s performance. Cygnus performed a series of engine burns to raise its orbit and pull into an orbital parking slot – trailing ISS at a safe distance to keep out of the way of the inbound Soyuz MS-02 spacecraft that delivered the Expedition 49/50 crew members to ISS on October 21. After the Soyuz docked, the way was clear for Cygnus and the spacecraft arrived in the Station’s vicinity on October 23 for a robotic capture and berthing to the Unity module. After opening the spacecraft’s hatch a few hours after its arrival, the ISS crew spent the last 30 days unloading 2,342 Kilograms of cargo and replacing it with 1,265 Kilograms of disposal hardware to burn up in Earth-‘s atmosphere. Aboard the spacecraft was the typical mix of science cargo (498kg), crew supplies (585kg) and maintenance equipment (1,023kg) plus computer resources and Russian hardware. Among the science hardware was a set of air samplers that will study solid particles suspended in the station’s air to assess potential dangers to crew health by examining particle sizes and chemical composition, also assessing their origin and possible mitigation techniques. Cygnus also delivered equipment for a new combustion study that examines ‘cool flames’ – a burning process in liquid fuels invisible to the human eye because it occurs at lower temperatures. Knowledge about this phenomenon could lead to better fire-protection systems on future spacecraft and help build cleaner-burning engines on Earth. 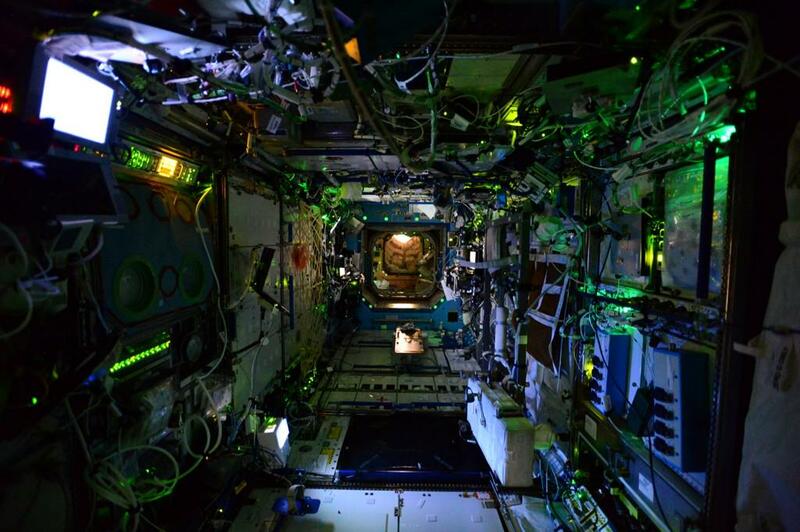 The OA-5 mission also delivered the first batch of LED lighting fixtures that will replace the station’s current fluorescent luminaires and provide a lighting environment tuned to the crew’s day-night-rhythm to hopefully improve sleep quality in space and allow crew members to be more productive during their day. 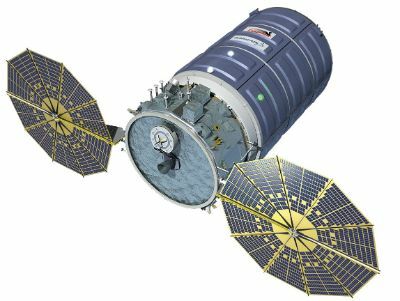 Also aboard Cygnus was a new experiment locker that actively counteracts spacecraft vibration, a Fast Neutron Spectrometer to study radiation exposure in space, and a materials science study looking at the crystallization of semiconductor materials. With Cygnus approaching the end of its stay at ISS, the crew began buttoning up the cargo compartment last week ahead of closing the Cygnus hatch on November 17 followed on Thursday by configuring the vestibule between the Unity module and the visiting vehicle prior to closing the Unity hatch. Power and data connectivity with Cygnus was provided through the Station’s robotic arm that had grappled the spacecraft earlier last week – taking advantage of Cygnus’ unique feature that is a Power and Video Grapple Fixture instead of the simpler grappling fixtures on other ISS cargo vehicles that do not permit power & data connectivity. 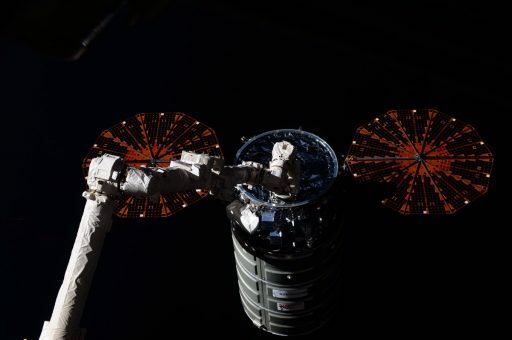 Cygnus was freed early on Monday when sixteen bolts were driven open and four capture latches opened up to give the robotic arm full control over the spacecraft that was then unberthed. 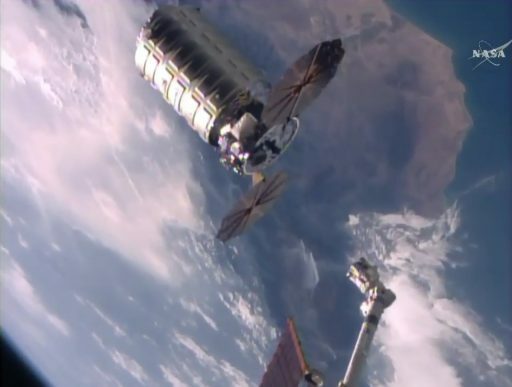 ROBO controllers on the ground carefully moved Cygnus away from the Unity module and then had the arm execute a series of pre-programmed maneuvers to position Cygnus for release. At that point, robotic duties were handed over to the Space Station crew, specifically Expedition 50 commander Shane Kimbrough who was at the controls of the Cupola Robotics Work Station, backed up by newly-arrived Flight Engineer Thomas Pesquet who handled communications and commanding of the Cygnus via the Hardware Command Panel. 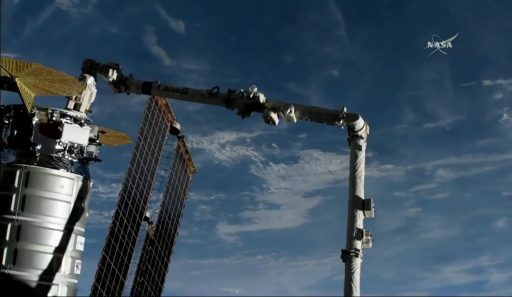 With Cygnus in its release position and the release window open, Mission Control Houston provided the crew a final GO upon which the brakes of the arm were released and snares opened to loosen the arm’s grip on Cygnus’ tail. Kimbrough retracted the arm from the aft end of the spacecraft and parked it in a safe position for departure – clearing the way for Cygnus to fire its engines. 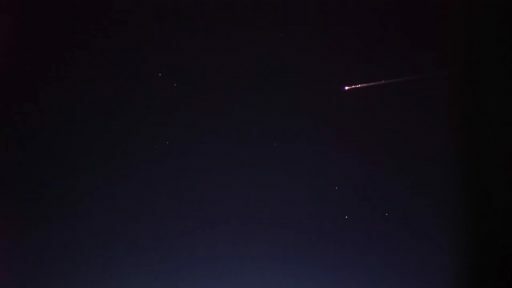 Release occurred at 13:22 UTC while ISS was flying 400 Kilometers over the Pacific Ocean. 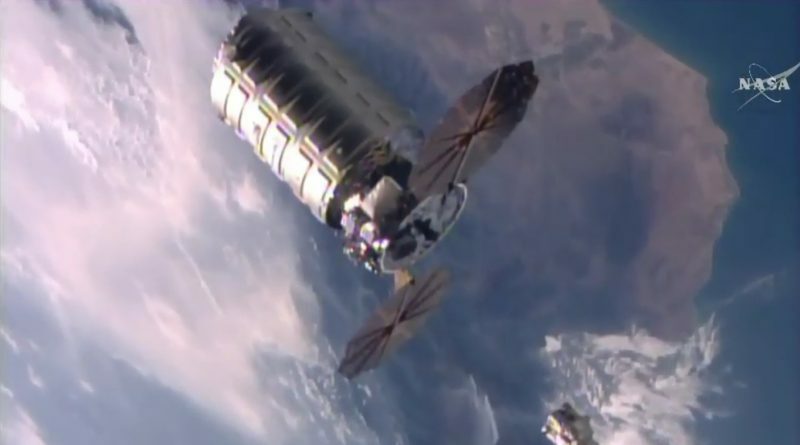 Cygnus recovered from Free Drift and enabled its thrusters for a gentle three-minute departure maneuver to accelerate its opening rate and pull out in front of the Space Station, heading out of the Approach Ellipsoid at which point NASA’s direct involvement in the mission ended and Orbital ATK’s control center in Dulles again had full authority over all mission-related decisions. 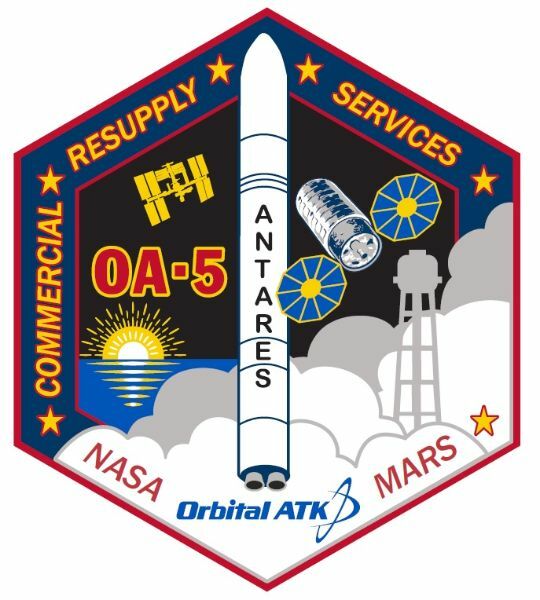 With Cygnus on its way, the OA-5 mission heads into a second phase dedicated to the SAFFIRE-II experiment and the release of four Lemur CubeSats. Set for 17:13 UTC on Monday is an orbit-raising maneuver prior to the initiation of the SAFFIRE experiment at 18:30 UTC. 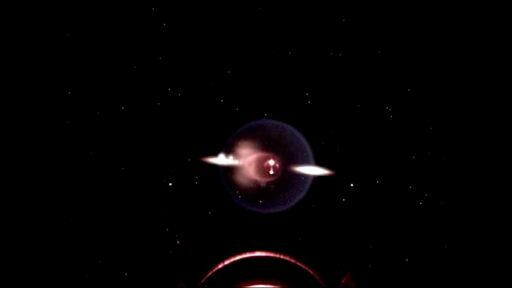 SAFFIRE-II is the second Spacecraft Fire Experiment in a series of tests that involve the largest intentional fires ever ignited in space as well as a series of flammability studies with different materials. 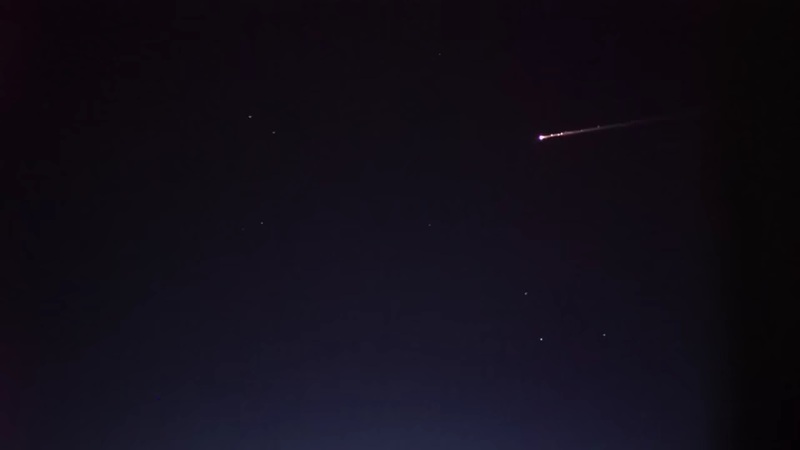 The first SAFFIRE experiment – performed on the OA-6 mission back in June – studied large-scale fire progression in space with a 0.4 by 1.0-meter piece of cotton-fiberglass blend that was ignited on one end with cameras and sensors watching over a number of parameters like flame front speed, temperatures, oxygen consumption and more. The second SAFFIRE experiment is different in that it involves nine smaller samples to examine the flammability of different materials at different thicknesses and their Maximum Oxygen Concentration (MOC) flammability limits. SAFFIRE is the first study of large-scale fire progression in space to deliver valuable information for the design of future spacecraft since fire represents one of the biggest risk potentials for human spaceflight missions. Operated by NASA’s Glenn Research Center, SAFFIRE-II will last up to a few hours with each sample being closely watched by cameras and sensors. 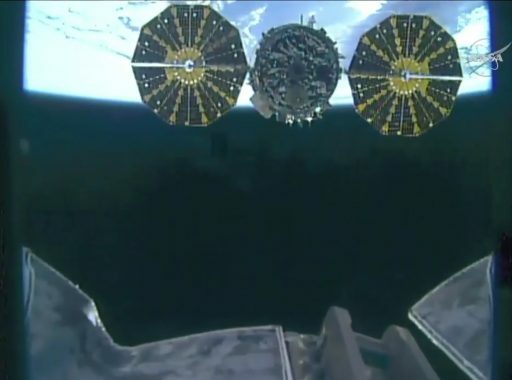 Due to the large volume of data generated by the experiment, Cygnus will remain in orbit for several more days to allow regular data downlink sessions. Lemur-2 Satellite – Photo: Spire Global, Inc.
Another activity planned for the week-long free flight is the release of four Lemur-2 satellites expected on Friday after Cygnus raises its orbit by around 100 Kilometers above that of the Space Station via two burns performed at 17:34 and 18:41 UTC on November 25. This will give the satellites a longer operational life compared to deployment from ISS into its 400-Kilometer orbit that leads the small satellites to decay in around a year’s time. 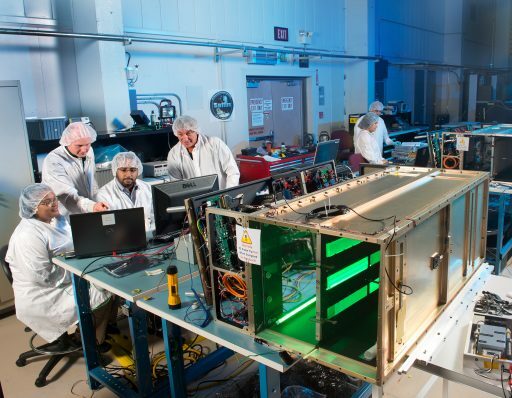 The Lemur-2 satellites are 3-Unit CubeSats built and operated by NanoSatisfi, now named Spire Global, to establish a constellation of small, inexpensive satellites in operation for a number of purposes such as Earth observation, maritime monitoring, communications, meteorology and science. 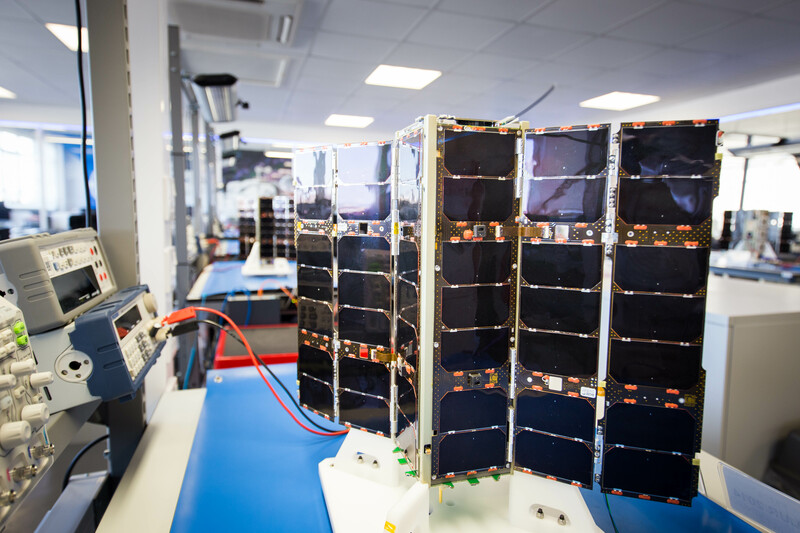 Each Lemur-2 satellite carries two different payloads, SENSE, dedicated to maritime monitoring, and STRATOS for atmospheric measurements. Deployment of the Lemurs is set for 21:05 UTC on Friday and 0:10 UTC on Saturday. Cygnus will conclude its mission on November 27 when it will fire its BT-4 main engine to set up a targeted, destructive re-entry. With Cygnus safely on its way after a successful cargo-delivery, the Space Station and its Expedition 50 crew are looking forward to another two vehicle arrivals before the end of the year. The Russian Progress MS-04 spacecraft is set for liftoff from the Baikonur Cosmodrome on the first of December for a two-day link up with ISS to deliver 2,300kg of food, fuel and supplies to the Russian Segment. Next up is Japan’s HTV-6 mission, set for liftoff atop an H-IIB on December 9th with arrival at ISS scheduled for the 13th. 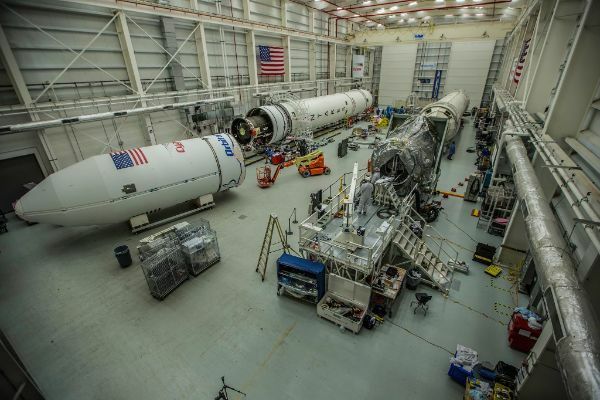 HTV will deliver new science equipment, a batch of fresh water and, most importantly, six new Lithium-Ion batteries that will replace the aging Nickel-Hydrogen batteries currently installed on the Station’s truss segment. A number of HTV missions will be needed to replace the Station’s batteries with the six delivered on HTV-6 destined for the S4 truss segment with installation scheduled in January via extensive robotics and at least a pair of spacewalks.